Originated at the Morden Research Station by Dr. C. R. Ure for the Prairie Fruit breeding Cooperative and selected in 1960 by the University of Alberta and the Beaverlodge Research Station, Agriculture Canada, and released in 1976. The tree is moderately vigorous, upright spreading to round headed, moderately precocious and annually productive. It is hardy to zone 2b and moderately resistant to fire blight. The fruit is medium-large, up to 6-7 cm (2.5 - 3") in diameter, round-conic to oblong in shape with a shallow stem cavity and basin, and matures in late August to early September. The skin is greenish-yellow base, striped to completely painted with orange-red, dotted with greenish lenticels and covered with a moderate pink bloom. The flesh is cream coloured to yellow, crisp, firm, juicy with a pleasant nutty flavour initially. It is good for fresh eating, good for cooking and stores for up to 16 weeks. 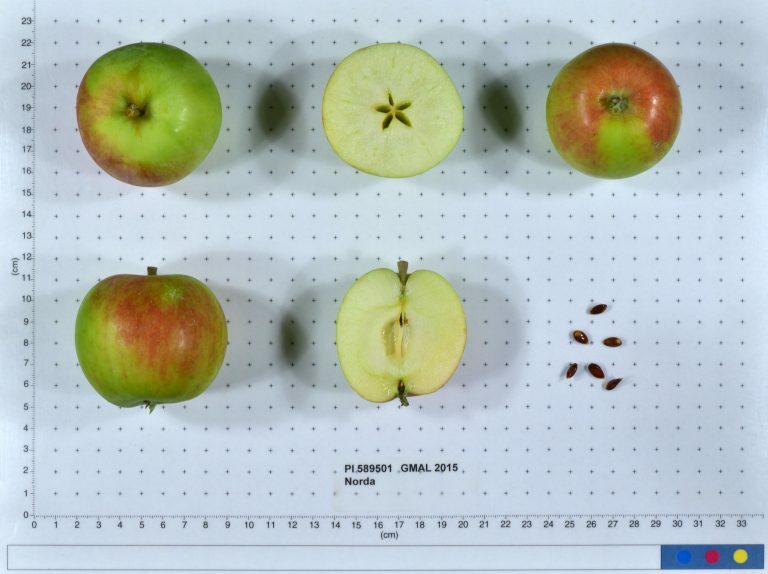 Note: see also >Norkent=) From USDA Germplasm website: Fruit: size, 5 cm standard; shiny dark-red overlay. Early ripening, dessert, good keeper. Consistently good yields. Flesh cream colored crisp, moderately juicy, very good flavor. Harvest season late September; stores at 4 C until mid- January. Tree: vigorous, upright-spreading, moderately hardy; relatively precocious, moderately productive.